Barcelona Metro : map, stations, pass, tickets, prize..
To visit Barcelona, it is important to have a little knowledge of the lines, map, hours and fares of the metro in Barcelona. This is the purpose of this page. Make it easier for you to travel during your stay, to get to all the tourist attractions in the city without asking too many questions and even buy a ticket in advance for your trips. The Barcelona metro is pleasant to use because it is clean, fast, economical and of course air-conditioned, which is more than enjoyable in summer! 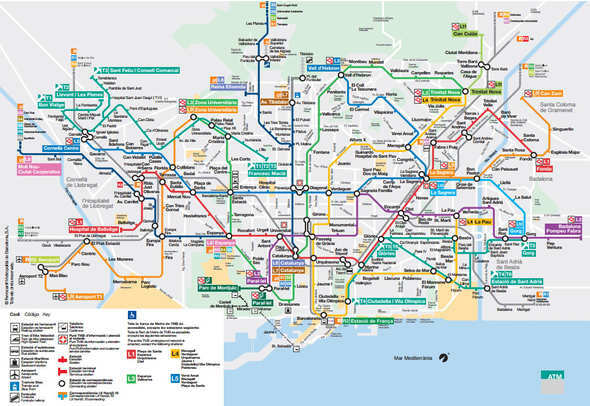 It is composed of 8 lines: L1, L2, L3, L4, L5, L9, L10, L11 managed by the company TMB (Transports Metropolitans de Barcelona). And 4 lines L6, L7, L8 and L12 belonging to the FGC (Ferrocarrils de la Generalitat de Catalunya). You can travel on its 12 lines with a standard metro ticket. TMB and FGC are the two logos you will look for in the street to find the entrance of a station. 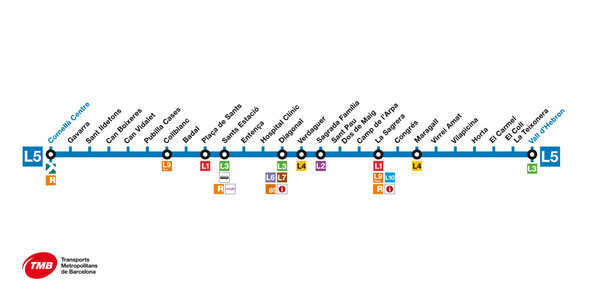 To facilitate your journey, you can click on the link below to download the official map of the Barcelona metro, it is a PDF, so you can print it and bring it with you. Good to know, you can also obtain it for free in the Tourist Office of EL Prat airport as in all metro stations. Monday to Thursday from 5am to midnight. All stops in Barcelona's metro network are in zone 1. This means that with a classic metro ticket or with your Hola Bcn or Barcelona Card tourist passes, you can reach any metro station in town. One exception with the standard ticket: from the airport you must buy a special ticket which costs 4.60€ to reach the centre or return to the airport. You can visit the following page if you wish to reach the city centre from Barcelona Airport with the Line L9. During the day, the metro usually passes every 2 to 4 minutes. While at night, the passages are less frequent, you can wait up to 10 minutes. A metro ticket or any public transport card is valid for any journey by metro, bus, tram or ferrocarril. You can buy individual tickets at the ticket machines. The Barcelona metro ticket price is 2.20 euros. You can also buy a T-10 card which allows you to make ten trips on all lines of the network for a price of 10.20 euros. Be careful, though! Neither of these two solutions is valid for taking the metro to and from the airport. In this case you must buy an airport metro ticket for 4.60 euros. Football fans, on FC Barcelona match days, there is a special ticket for you to use the buses that serve the Camp Nou stadium: the ticket costs 3.10 euros. Children up to 3 years do not pay in Barcelona network - Children from 4 years pay the full fare. A ticket is valid for 75 minutes (an hour and a quarter), during which time you can make as many line changes as you like without leaving the metro. Barcelona's metro is very secure and guarded. There's no point trying to travel without a ticket. It is unlikely that you will escape control in this case. How to reach Barcelona's main monuments by metro? Which subway for the Sagrada Familia? To get to Barcelona's Sagrada Familia by underground you can use two lines L2 and L5. The station is called without surprise Sagrada Familia. Line L2 - Violette - is very practical because it passes not far from the Plaça de Catalunya with the Passeig de Gràcia station - that is to say the centre of Barcelona. Which metro for the Camp Nou? To get to the FC Barcelona Stadium known as Camp Nou by metro you can use metro lines L3 and L5. 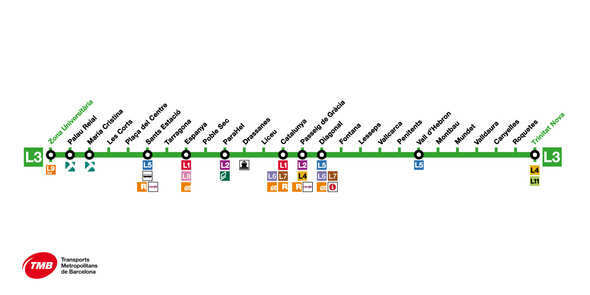 Line L3 -Green- very practical because it passes through the centre of Barcelona and therefore the most visited places. The two resorts closest to Camp Nou are Palau Reial and Les Corts. Line L5 - Blue - crosses it we have all the city, it is necessary to choose the stations CollBlanc or Badall and to make a small walk of about ten minutes. The nearest station to Camp Nou is CollBlanc. Which metro for Casa Milà - La Pedrera by Antoni Gaudí? To visit Casa Milà the nearest metro lines are L3(green) and L5 (blue). The two lines L3 and L5 , stop at the Diagonal station which is the closest to Casa Mila from where you only have 200 meters left to walk. Which metro for Antoni Gaudí's Casa Batlló? The metro stations to go to Casa Batlló are lines L2 (violet), L3 (green) and L4 (yellow). These three lines pass through the Passeig de Gràcia station which will be your stop. From there are two blocks to go up to discover the Casa Batlló. The Hola Bcn Card or the Barcelona Card are two serious options to consider for your transport needs as they offer an unlimited number of trips by metro, especially to and from Barcelona airport. More explanations on the two pages in question. Finally, another way to discover the city is the Hop-on Hop-off Bus which we also explain all the advantages. 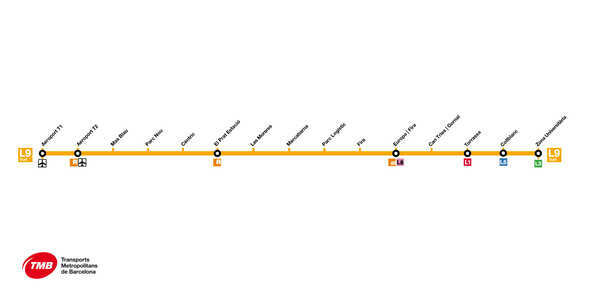 Barcelona metro stations, lines, stops, changes and connections. The red line crosses the whole city from east to west and stops at many tourist places such as the Arc de Triomphe (Parco de la Ciutadella), Plaça Catalunya and Plaça d'Espanya. 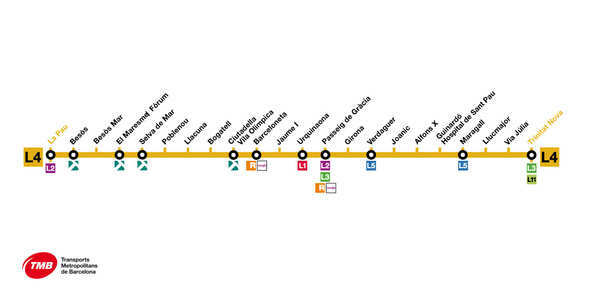 Its main connections are with the yellow line at metro station Urquinaona, the green line at Plaça d'Espanya, the purple line at Plaça Universitat or Clot and the blue line at Sagrera-Meridiana or Plaça de Sants. The purple line connects Badalona to Parallel. The main points of interest of this line are the Sagrada Familia, Passeig de Gracia and Sant Antoni in the Raval. 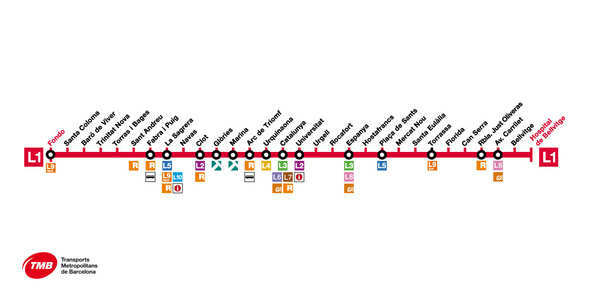 Its main connections are with the yellow L4 line and the green L3 at metro station Passeig de Gracia, the blue L5 at Sagrada Familia and the red L1 at Plaça Universitat or Clot. This line has 3 stops on the Rambla (Plaça Catalunya, Liceu, Drassanes) then continues north to Passeig de Gracia and Diagonal, while on the other side continues to Plaça d'Espanya via the Poble Sec and Parallèle. This metro also has stops near Parc Güell (Vallcarca), Camp Nou (Les Corts) and Parc du Labyrinthe de Horta (Mundet). Its main connections: with the blue L5 line at Diagonal, the red L1 at Plaça Catalunya and Plaça Espanya, the yellow L4 at Passeig de Gracia and the violet L2 at Parallel and Passeig de Gracia. It connects the fashionable district of Gracia, north of the city with the Passeig de Gracia, the square of the Gothic Cathedral then heads towards the main beaches, those of Barceloneta and the Olympic port. Its main connections are with the red L1 on Plaça Urquinaona, with the violet L2 in Passeig de Gracia, with the green L3 in Passeig de Gracia, with the blue L5 in Verdaguer. It's a line to the business districts. It is however useful to join the station of Sants, Badal (for those who visit the Camp Nou) and the Sagrada Familia. 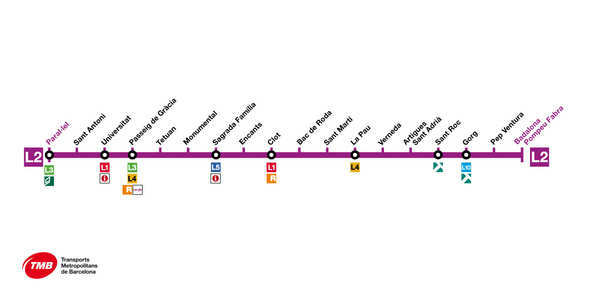 Its main connections are with the green line L3 to Diagonal, the yellow L4 to Verdaguer, the purple L2 to Sagrada Familia. It connects the two terminals T1and T2 of Prat airport with the other lines going towards the centre. It's the newest in the Barcelona network. These main connections are with the orange line, with the red line at metro station Torrassa, with the blue line at Collblanc and with the green line at the university zone. The other lines are less interesting for you to discover, as they are quite far from the tourist attractions of the city. Barcelona's metro is constantly improving its accessibility for people with reduced mobility. Since 2012, for example, a relief map of the metropolitan network and a Braille metro guide are available at TMB information points. Sound and light devices have also been installed. To date, more than 90% of Barcelona's metro network is accessible to people with reduced mobility. However, 15 stations out of a total of 156 stations are still undergoing adaptation work. L1 : Plaça de Sants, Espanya, Urquinaona and Clot. L4 : Maragall, Verdaguer, Urquinaona, Ciutadella-Vila Olímpica and Jaume I (project in progress). L5 : Virrei Amat, Maragall, Verdaguer and Plaça de Sants. Catalunya L1/Rodalies (commuter trains) - L3/FGC (the connection between L1 or Rodalies at L3 and FGC is not accessible in both directions). Passeig de Gràcia L2/L4 - L3/Rodalies (suburban trains) /Renfe (main line trains). (The connection between L2 and L4 to L3 and Rodalies/Renfe is not accessible in both directions). Come arrivo dall'aeroporto di Girona al l'hotel Turin? Comment se rendre de l'aéroport de Barcelone à L’hôtel Acevi Villarroel? comment se rendre de l;aeroport de barcelone au centre ville :hotel Acta Antibes? quelle ligne de metro prendre pour l hotel flor park ? Comment se rendre de l aeroport de barcelone a calella de palafrugell ? Alguien me sabe decir como llego del Aeropuerto T2 (BCN) al Hotel NH Sant Boi? Comment fais t on por aller de la gare de Sant a l aéroport. Comment se rendre à l'hotel AC Hotel Barcelona Forum by Marriott Paseo Taulat, 278, Sant Martí, 08019 Barcelone depuis l'aéroport de Barcelona. Comment se rendre de l'aéroport el prat à notre hotel le " novotel sant cugat" ?